Inbound Marketing is a new marketing theme aimed at Digital Marketing, Inbound Marketing and Landing Pages. It comes with pre-built pages which you can use and edit or use the included Visual Composer plugin to easily drag-and-drop to create your own unique layout. It comes with custom shortcodes too, giving you more personalisation to make the site unique to your business. 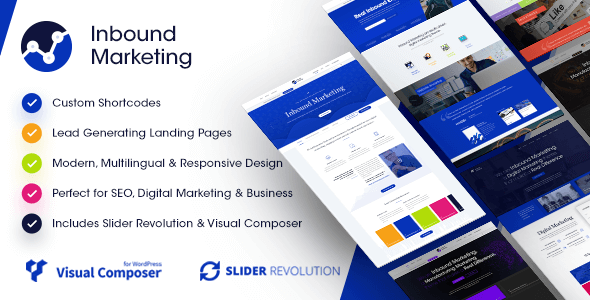 There are multiple pre-built landing pages too which you can modify to your needs that are perfect to capture visitors contact details, the art of inbound marketing!